Sports Cars Oakville – Budds’ BMW Oakville. If you are looking to purchase sports cars Oakville, Budds’ BMW Oakville has got a massive selection of sports vehicles to choose from. If you have a need for speed combined with the desire of a slick and sporty looking exterior look, the exceptional driving machines at Budds’ BMW Oakville will appeal to you. Sports cars Oakville are designed to be low to the ground so they can hug the road at high speeds. Our inventory is rich with sports car models that provide the driver with an exhilarating and dynamic driving experience. Our M-series vehicles are popular with drivers who are looking for sports cars Oakville. All M-series vehicles are equipped with Sport Mode, so you can experience sportier driving qualities with your vehicle and enhance your experience. The M from M GmbH has been a continually recognized sign for sports cars Oakville. Budds’ BMW Oakville’s line of M vehicles insist on continuing their dominance as a sports car mecha. The BMW M2 Coupe, the BMW M3 Sedan, the BMW m4 Coupe, the BMW M4 Convertible, the BMW M5 Sedan, the BMW M6 as Coupe, Gran Coupe and Convertible as well as the BMW X5 M and BMW X6 M. These BMW models are all equipped with the most innovative technology, attractive design language, and technical engineering to own the title of exceptional driving machines. 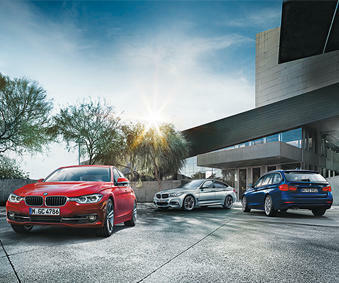 All of these cars are available with Sports Mode letting you enjoy your BMW’s dynamic character at its peak. Budds’ BMW Oakville provides our customers who enjoy a riveting experience behind the wheel, with a huge inventory of sports cars Oakville to choose from. Depending on which BMW model you drive, the Sport Mode can be initiated by the pressing of a button saying “Sport” on your central console. Once Sport Mode is activated, your BMW engine output and driving dynamics will take on sportier qualities. Immediately your BMW will feel more responsive and even sound different. You will feel your suspension get stiffer and your engine will become more responsive. The increase in sports power will for a reduction of power assistance for the the steering when you are at low and medium RPMs. You will feel more direct and immediate steering, giving you an even closer sense of the character of the road. On automatic transmissions, activating Sport Mode will shorten gear shift times and make your driving experience even more dynamic. If you are looking into purchasing your own sports cars Oakville, we recommend you come into Budds’ BMW Oakville to look through our massive inventory of M-series vehicles. You will receive outstanding customer service from the moment you step foot into the dealership!